I love this handblender. I use it for mixing, blending and chopping. it is so handy that I don't have to take out blender or other stuff. clean up is a breeze. Love it. ohh boy!! I am so inlove with this blender..it's super easy to use like, mixing, and blending..it's was so lucky that I was able to tried to use this king of blender..it's totally a life saver..and take note it's easy too clean up too..that's why I love this blender.. I love my Cuisinart smart stick so much I bought one for my daughter as a gift! I am actually in the market to get a new one for myself seeing I use it so often. My son had an unfortunate accident and had his jaw wired...this thing made everything drinkable!! Also love using the smart stick to make soups and mashed cauliflower super smooth. Very handy and less to clean up. Gave away my Osterizer to my sister. Mixes up soup and Pasta sauce (gravy) in a NY minute. When my previous Braun hand blender gave out after 11 years, I replaced it with the Cuisinart smart stick. The smart stick died after 5 months but Cuisinart sent me a replacement ( they charge you $ 10.00 shipping but they stand behind their product so I'm pleased). This is awesome for mixing together liquid ingredients. I use it for my salsa verde recipe all of the time! It leaves much less of a mess than a regular blender! I love love this blender. It's awesome in many ways. easy to blend, chop, mix and CLEAN! I buy electronic items only if I know for sure that they will be easy to clean. I hate messes to clean after trying to blend fruit juice. YES! I even make few juices with this hand blender (like watermelon, apple, orange). anything that can pulp is great to blend. Was given this as a gift, and am loving it. I find myself looking for a reason to use it. I purchased this for myself and my son took over it. He works out and does a lot of protein shakes. He uses it several times a day. He loves it. I am going to have to purchase another one. Best for everything! Super for soup. I also have an attachment that makes single serving whipped cream a breeze! Easy to clean and use!! Great product!! bought this product and wasn't sure if i would actually utilize it. i thought it might be one of those purchases that sat covered with dust. but i was wrong this product is so useful. 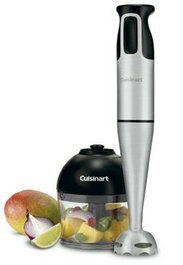 i use it to puree my soups instead of a blender because the clean up is soo much easier. i utilize the whip attachment when i make whip cream instead of pulling out my mixer. it is so versatile.